For me, apprehension around flying stems from a series of unfortunate events that would make even the most frequent of flyers sob into their overpriced airport coffees. I’ve been on a plane and the windshield has cracked, I’ve been on a plane where a bird flew into the engine, I’ve flown through lightning storms and torrential rain that flipped the plane around the sky like an over-caffeinated kitten batting a defenceless ball of string. So when the opportunity came for me to undertake a Fear of Flying Course, I did my best to dodge it…but was sent anyway. Fear of flying can be caused by many things: a bad experience in the air, anxiety at not being able to control your environment, distress over interacting with strangers or knowing somebody will recline their chair and crush your knees with their selfishness. In fact more than 25 per cent of people suffer some form of anxiety when it comes to travel. But, I’m not one of those people who let a fear of flying affect their life. Or so I thought. When I arrived at Flight Experience in Newstead for the Fear of Flying Course I was filled with a sanctimonious smugness that came from knowing I wasn’t there because I had some sort of hysterical fear I couldn’t move past. I was merely there to find out what causes others to break down in a cold sweat and avoid planes and then relay the information back to them in a neatly packaged article. However, my Mother Teresa vibe was quickly shattered when psychologists’ Jeannet Weijers and Michelle Choma began talking about the different types of fears that cause people to develop flight phobia. “Fear that you are going to die is common element when it comes to flying phobias but it’s not the only fear,” they explain. These words jolted me more than our spin in the centres’ flight simulator did, because they gave voice to a sheltered fear that I had not realised was creeping into my life. You see, I’m jetting off on my first trip to Europe in a few short months, a place I’ve always dreamed of visiting and yet I just can’t seem to muster any excitement about it and suddenly I knew why. Weijers and Choma’s presentation showed me that while fear of death wasn’t holding me back, a fear of not being able to control my environment had become all encompassing. Fear that I would be uncomfortable on such a long haul flight, fear of feeling sick, exhausted or claustrophobic and not being able to do anything about it. I couldn’t picture myself in Paris without seeing myself in a cramped seat with a splitting headache and knowing there was nothing I could do about it. It’s a legitimate fear that can build into a phobia and is just as crippling as the fear of death aboard a plane. The Fear of Flying Course uses Cognitive Behavioural Therapy strategies to combat in-flight anxiety. Scaredy cats like myself are trained to recognise the root of their fear, rationalise the situation using information about flight protocol and the mechanics of flying before using a series of calming exercises to make their situation as comfortable as possible while accepting the reality of the situation. While many people have suggested downing a cocktail of sleeping pills to snooze away the flight, Weijers and Choma pointed out the flaws in that plan. Flights can be delayed, cancelled, make emergency stops and a whole swell of situations, thus it’s inconvenient to be unconscious. Fixing the way you face flying while mentally preparing yourself for the situation is the key to overcoming your fear and leaving anxiety behind. Take it from me, I’m now dreaming of France. The Flight Experience Fear of Flying Course includes a face-to-face consultation with a psychologist to identify the cause of fear and plan the treatment process. Professional airline pilots are also on-hand to offer information about aviation and talk about the stringent safeguards that have been put in place for airline travel. 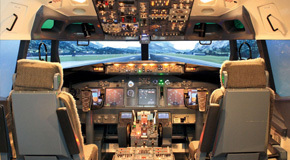 Skills learned in Cognitive Behavioural Therapy sessions are then put to the test in the flight simulator.